There is something so charming about a historic downtown area, don’t you think? Walking the streets, seeing the uniqueness of each town’s history, and getting to see what’s important to them – that’s what walking downtown does. 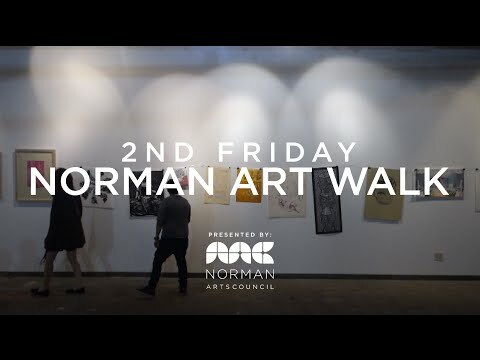 In downtown Norman, OK each month there is an event called 2nd Friday Art Walk which has you exploring and getting to know not only the beautiful downtown area of Norman, but also the life blood of the local art scene. This is no rinky-dink event. Executed beautifully each month is a multi-site, multi-vendor, multi-artist event that will leave you feeling and thinking deeply about the subject matter. But if you’ve never been before, you may be wondering what there is to know about the 2nd Friday Art Walk. Don’t worry – we’ve got you covered. 1. It’s the 2nd Friday of Each Month – All Year Long! Ok, so maybe the first part was obvious, given that it’s called the ‘2nd Friday Art Walk‘ but sometimes cities will only host these events in the Spring and Summer. Norman hosts the 2nd Friday Art Walk all year long! This isn’t a one-stop event. There are participating non-profits, like the Firehouse, MAINSITE, Depot Gallery, Norman Public Library, and Visit Norman, as well as studios, galleries, and shops. From the Norman Arts Council and the Norman Music Festival, to local establishments like Michaelangelo’s, Red Brick Bar, or The Bluebonnet, you won’t just get to see great art, but hear it, as well. Truly making sure you experience the event with all of your senses, Food Trucks take over Peters between Main and Grey during the 2nd Friday Art Walk. Not only do you get to experience so much great art, entering each venue is possible at no cost. Plan on bringing a little spending money for the food trucks or the shops where handcrafted pieces are sold during this event. This great event is presented by the Norman Arts Council, along with amazing sponsors, who puts heart, soul, and elbow grease into each of these events. Learn more about this month’s upcoming lineup at the 2nd Friday Norman Art Walk. And locals and tourists alike love this event! To turn it into a getaway whether you are local or an out of towner, consider staying with us at the Montford Inn and Cottages. Within walking distance of this great event, you’ll find the Montford Inn and Cottages a little slice of home away from home – where someone else makes and cleans up the breakfast and you just get to relax. Now that’s a work of art!